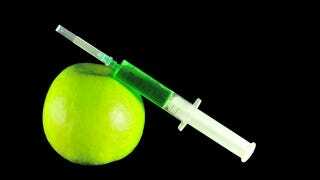 The latest diet craze involves injecting the hormone hCG (human chorionic gonadotropin) while eating just 500 calories a day. Do not do this. A 500-calorie-a-day diet is just plain dangerous. When you restrict calories to that level, there's a real risk for not providing your body with enough essential amino acids, so it scavenges itself. In some instances, it can cause the body to scavenge from critical places, like the heart. However, Dr. Mehmet Oz says the diet deserves further study: "By researching hCG ... we might find new ways to help millions of people, who do not have another solution, find an option. And, for that reason, I think it's worth investigating." On his show, he calls HCG "the diet that has everyone asking, 'How can I get on it?'" (this despite a report another doctor wrote for the show stating that extreme calorie restriction is dangerous and HCG supplements are ineffective). Oz says the regimen is worth trying, albeit under a doctor's supervision. So if you can find a doc who is totally fine with the prospect of heart-scavenging, go for it! But seriously: don't.